Few books in the music world this year are drawing as much excitement as the arrival of K.K. 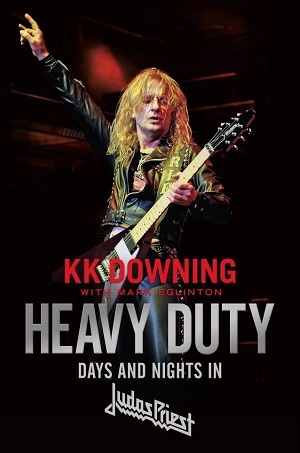 Downing and Mark Eglinton’s “Heavy Duty: Days and Nights in Judas Priest,” due out tomorrow (Sept. 18) via Da Capo. Downing has stayed largely out of the spotlight since parting ways with Judas Priest in 2011, but this fascinating work brings him back into the light, much to the heavy-metal delight of many Judas Priest fans. “Heavy Duty” starts with some early, personal stories about Downing’s difficult time growing up. These stories lay out the foundation for the big things Downing eventually accomplished. As the book progresses through more of Downing’s life, he and Eglinton paint a vivid picture in the way great fiction novels read—- except this is isn’t fiction. It’s the real deal. Judas Priest fans will really enjoy this book’s pages describing the band’s early days, from getting signed to a record label to the group’s first fiery gigs. As each page of “Heavy Duty” gets turned, the books flows with ease and cohesiveness, making this a fascinating read from front to back. It’s difficult to pull away. Upon the announcement of “Heavy Duty: Days and Nights in Judas Priest,” Downing stated that is was his “proudest moment to be able to share it with you.” Reading through the book, it’s obvious why. Both die-hard Judas Priest fans and casual admirers of the band will find lots of enjoy in “Heavy Duty.” It’s a book that has heart and passion, and that makes it a metal must-read. Full details: “Heavy Duty: Days and Nights in Judas Priest” by K.K. Downing and Mark Eglinton will arrive via Da Capo on Sept. 18, $28. Pre-order the book via Amazon here .